Earlier this week, KingsIsle launched a brand new EverClicker update centered around guilds. Naturally, avid players jumped at the chance to team up with some of their clicking pals. Back when the guild update was accidentally released into”beta,” some lucky android users got to take an early look around. During this time, Harmony (@harmonyeverhart on Twitter) created the very first guild – Spiral. However, since the update wasn’t supposed to be out yet, KingsIsle ended up disabling the android users’ access to guilds until the feature officially went live across all devices. Luckily though, the Spiral guild survived the temporary shutdown and was active once again as soon as KingsIsle flipped the switch! Since I found out about the update pretty early in the day, I had no trouble getting my spiral guild request accepted. 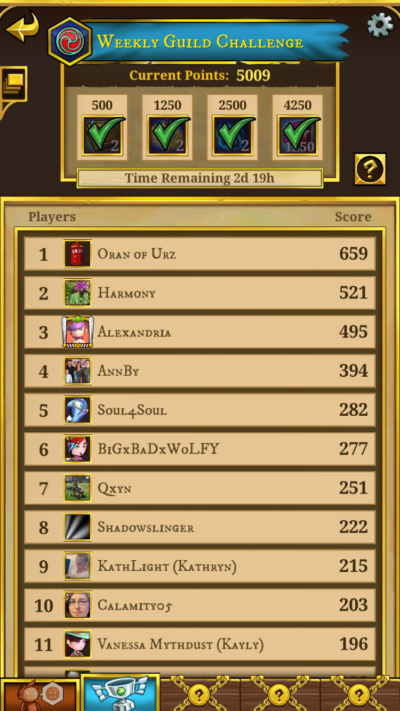 What I didn’t expect though – was being promoted to guild leader. Harmony and Paige Moonshade apparently concocted the secret plan. Well played, well played. The rest of the day was much more … hectic. The Spiral guild must’ve gotten at least 100 guild requests within a few hours, and the number kept increasing as the day went on. All of these fantastic and familiar people popped up on the screen, but we knew we wouldn’t be able to accept everyone we wanted to. It was hard to narrow it down. Luckily, an extension guild (Spiral 2) was created to house the people who unfortunately did not make it into the original Spiral guild. If you’re still looking for a guild, go see if they have a few more spots open! Guild Leader (1): Can change guild icon, create a guild message, approve/deny guild requests, appoint Guild Officers, and remove Guild Members. Guild Officer (5): Can approve/deny guild requests, appoint other Guild Officers, and remove Guild Members. Guild Member: No special privileges. 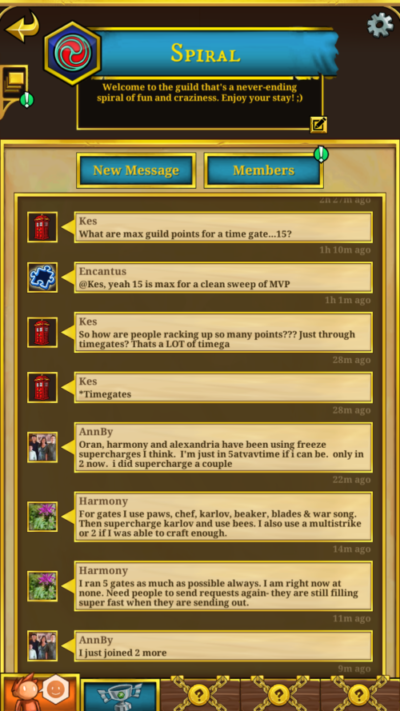 Each guild can have a max of 25 people (the game has a visual bug right now that shows the max as 20). Getting the chance to interact with the people you’ve been playing with is really exciting. I’m loving this social aspect and think it’s neat that KI incorporated an MMO-like element into one of their mobile games. The layout is pretty simple and easy to use. All you have to do is click “New Message” and then you’ll be able to type anything you want up to 170 characters. The only downside to the guild chat is that you can only view the last 30 messages. If you’re not online when all the chatting is going on, you may miss something. Being a part of a guild allows you to work together towards some amazing rewards. There are 4 different rewards in the Weekly Guild Challenge, and each is earned at a different guild milestone. Guild points reset at the end of every week, so make sure to work together efficiently! The Spiral guild absolutely obliterated all 4 milestones with almost 3 days left to spare! I’m hoping we can keep it up! Although the new guild system was the highlight of the update, 2 new pets also snuck into the game. EverDrake ($14.99): This pet increases all gold dropped by 150% while active. In addition, the EverDrake is the first pet to come with its own hero power. Dragon Flame deals 10x your DPS in damage for 5 seconds. I bought this pet when the update came out, and I’m loving it. The gold increase is a time saver and the hero power is helpful at bosses. The power may not last long, but it packs a big punch. Plus, the cooldown is very short (8 minutes, 4 seconds for me!). PolarPaws (25,000 Gems): This pet has the ability to freeze time gate and boss timers. All you have to do is catch some snowflakes! I don’t have enough gems for this pet yet, but I hear that it’s been pretty helpful for my guildmates. With time gate competition now stiffer than ever, that extra 30 seconds can certainly make a huge difference! What do you think of the new EverClicker update? Should guilds also make their way into other KI mobile games? Share your opinion below!